Dubai, UAE, October 01, 2018: Ideal Standard, one of the leading providers of innovative bathroom solutions operating across Europe, Middle East and Africa, has launched a new hip range of bathroom mixers; Its name: Ceraline. Following a cylindrical design pattern, a prominent present-day trend in the UK, EU and Middle East, Ceraline range is in keeping with the high standard of all Ideal Standard’s products. Its cylindrical shape provides a soft and stylish elegance for all the collection; one that checks the ‘versatility box’ too. With six different basin mixers, both rim-mounted and built-in, with bidet, bath and shower mixers wall mounted and built-in, there is no need that remains uncovered. 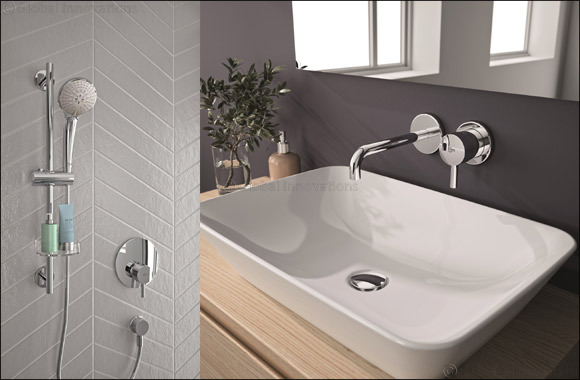 No matter the type of installation or stylish choice, there is a Ceraline mixer that will fulfil aesthetic and functional demands and will realize your ideal bathroom. Being eco-friendly is among the top priorities for Ideal Standard, Ceraline is not only a beautiful collection of mixers, but a reliable solution for the bathroom, with amazing water saving and safety features. Basin mixers are equipped with a 5l/min aerator that reduces water consumption with no loss of flow, to perform in the most demanding environments, while reducing the bill. The shower and bath & shower, exposed and built-in, mixers are packed with Click Technology, giving the option of using the fittings at 50% of their capacity, therefore achieving 50% less water consumption. Hot water limiter is a safety characteristic that ensures quick and easy control of maximum water temperature for ultimate safety. This allows the user to choose the maximum temperature and thus avoid the risk of scalding, which is important especially for kid users. Last but not the least, hassle-free and seamless installations are possible thanks to Ceraline range. It uses the EasyFix system, which is a single stainless steel bolt that secures and centres the rim-mounted mixer automatically. All components come pre-assembled to save time. Ceraline’s innovative water saving features make it environmentally sensitive, and its ergonomic design add aesthetic pleasure as well as practicality to any space it is adapted to – be it a home, an office, a hotel, restaurant, mall, or any other public space. Ceraline represents a wide range of quality fittings compatible with Ideal Standard ceramic sanitary ware. This makes incorporating Ideal Standard’s products into renovations as well as new constructions super easy and grant users the gift of harmony and symmetry in their bathroom spaces.